Babbling streams will be your soundtrack as you challenge yourself on the lush singletrack within Bothe-Napa Valley State Park. The course is a bit challenging with the hills, streams and rocks - which makes it all the more exciting and rewarding. This state park is a local treasure that is untapped by tourists and located just minutes from the area's great restaurants and wineries. The event is limited to 300 participants and sells out every year so don't wait too long to register! 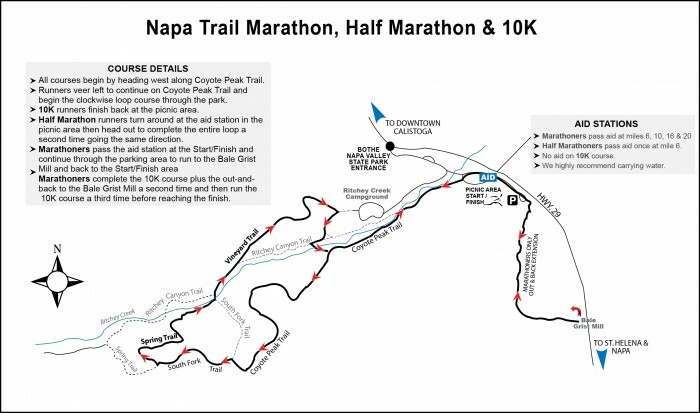 NOTE: This event is in no way associated with the 38th annual Napa Valley Marathon (road race) on Sunday March 6, 2016. COURSE CUT-OFF TIME: 6 HOURS (13:45min/mile pace for marathoners, 27:30min/mile pace for half marathoners, 58min/mile pace for 10Kers). Hikers/Walkers are welcome to participate. ATHLETE CHECK-IN: If you received your bib in the mail, you do not need to check-in. If you need to pick up a bib or change your distance, you can do so at from 8:00-8:50AM. Safety pins and course maps will also be available during athlete check-in. COURSE MARKINGS: The course will be marked with orange ribbon anywhere you need to make a turn or cross a trail. The 10K course is a single loop. The Half Marathon course does the 10K loop twice. Marathoners will start by running the 10K loop, then pass through the start/finish area and head south to complete an out-and-back extension to the Old Bale Grist Mill. The Marathon does this (10K loop plus 4-mile out-and-back) twice before completeting a final 10K loop. AID STATIONS: There is one aid station at the start/finish area. Half marathoners will see it once in between their two loops. Marathoners will see it at miles 6, 10, 16, 20. We highly recommend that you carry water. INCENTIVES: T-Shirts for all participants. Rubber chicken to the first place overall male & female in each distance. Personalized award ribbons to the top three finishers, male and female, in each age group for all distances which will be mailed out a few weeks after the race. Finisher medals for Full Marathoners only. BIB NUMBERS: Bib numbers will be mailed out to participants beginning two weeks before the event. If you do NOT receive a bib prior to race day, you will pick one up on race day morning. If you did not supply a valid mailing address when you registered, or if your mailing address has changed, please e-mail us at info@envirosports.com. 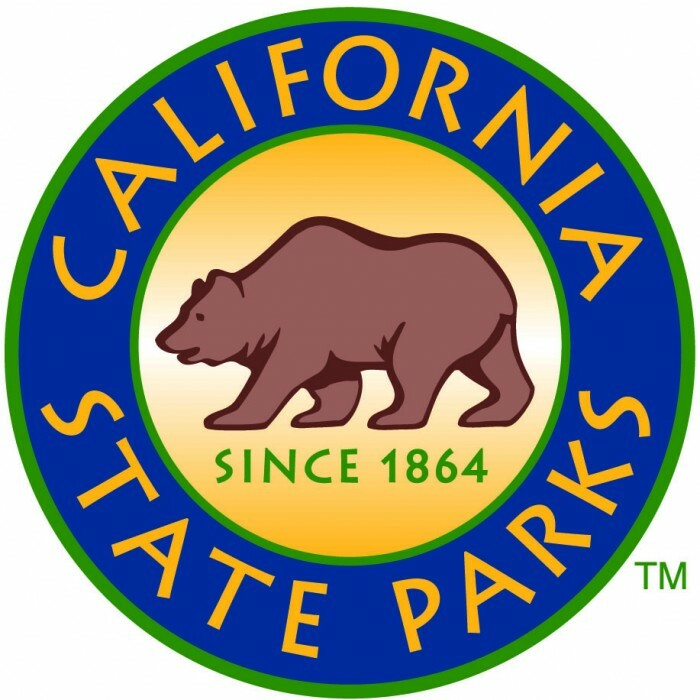 PARKING: is $8 per vehicle in Bothe-Napa State Park. Free parking is available along Hwy 29 outside the park; this is also our overflow parking once all spaces within the park are full. If you are parking along Hwy 29, be sure to park legally or you will get ticketed! DRIVING DIRECTIONS: Google Maps Link to Park Entrance. CANCELLATIONS: Registrations are non-refundable and non-transferable. If you email us by February 19, you may receive a rollover credit (the amount you paid minus a $10 fee) to use toward any future Enviro-Sports race. 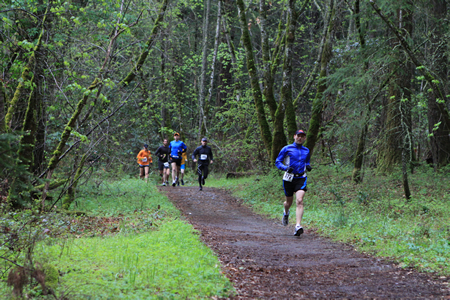 HEADPHONES POLICY: Since parts of this race include very narrow trails with steep drop-offs along the course, it is imperative that runners can hear each other in order to pass safely, even if they are running at a slow speed. For safety reasons (and for the enjoyment of your fellow runners) headphones (and any other audio devices) are NOT allowed.